In the colder months, you can typically find me bundled in a sweater, holed up inside, hoping for spring to arrive. Now that it’s officially here (at least in the Pacific Northwest), I’m absolutely thrilled. This is the time of year to get outside for my exercise, sit on patios, soak in the sun, and transition my diet to lighter foods instead of the hearty comfort dishes my body craves all winter. Let’s kick off the new season with a salad, shall we? This salad was inspired by one that I tried while we were in San Diego. Though my interpretation of it is quite different, the main elements remain: lots of ginger, super crunchy vegetables, and tons of flavor. This recipe is simple, requiring just 30 minutes to prepare. 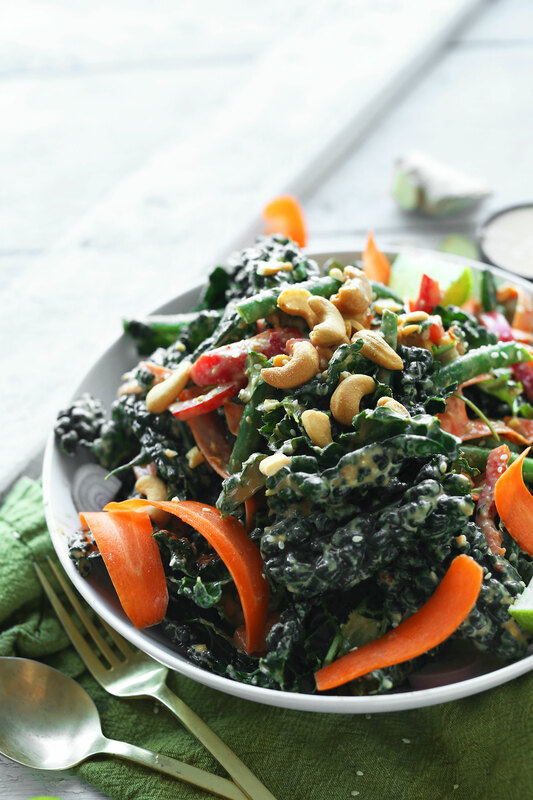 And it’s full of good-for-you ingredients like kale, green beans, red pepper, cashews, sesame seeds, and carrots. 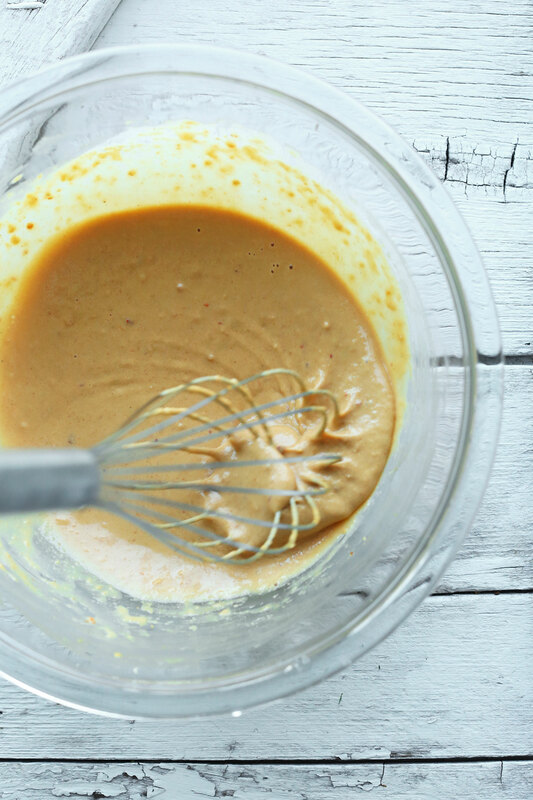 The dressing is cashew butter-based – a recent favorite of mine! Plus, I’ve recognized that not everyone can enjoy peanuts (sad, sad day) and it’s fun to switch it up sometimes. 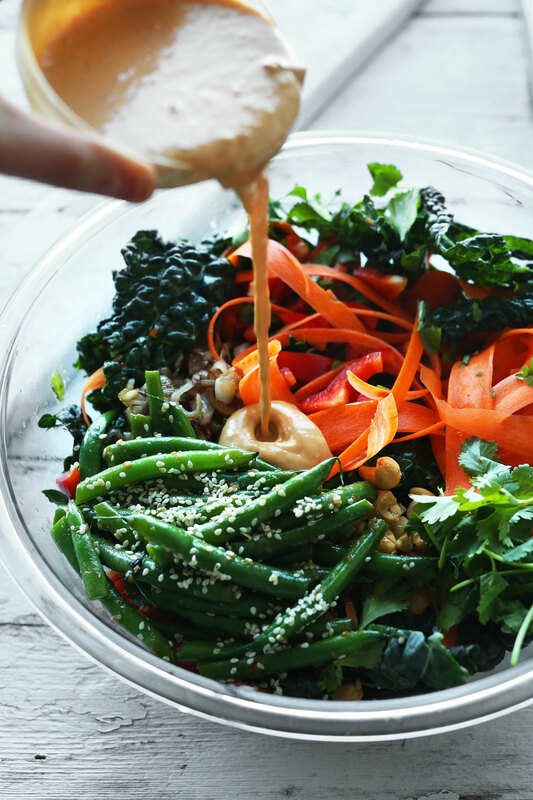 The result is a super creamy dressing infused with tamari (or soy sauce), lime juice for acidity, maple syrup for sweetness, and sesame oil for a slightly nutty flavor. Make this salad when you’re craving something healthy yet filling for dinner. It’s ideal for preparing ahead of time and bringing along to work or running errands (just keep the dressing separate so the greens remain crunchy and fresh). I also think it would pair well with my Thai Iced Tea and Creamy Thai Carrot Soup with Basil. If you try this recipe, let us know! Leave a comment, rate it, and don’t forget to tag a picture #minimalistaker on Instagram. We love seeing what you come up with. Cheers, friends! 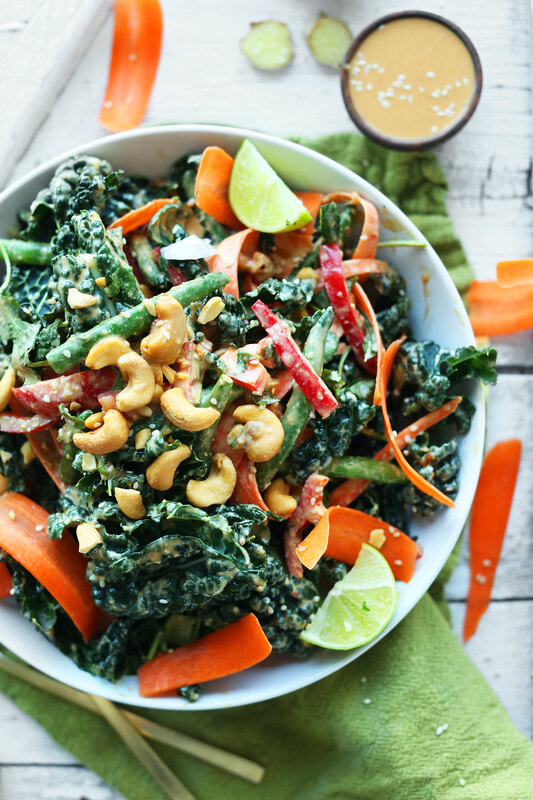 A 30-minute Thai-inspired kale salad with tons of veggies, roasted cashews, and a gingery cashew dressing! A hearty and flavorful plant-based entrée or side dish. Steam green beans slightly so they still have a bite, either in a steamer basket on the stovetop, or in the microwave. Then transfer to a small mixing bowl and top with tamari, sesame oil, maple syrup, and sesame seeds (optional). Toss to combine, then transfer to refrigerator to chill. Heat a small skillet over medium-low heat. Once hot, add sesame oil and shallot. Sauté for 2-3 minutes, stirring frequently, until softened and slightly golden brown. Remove from heat and set aside. 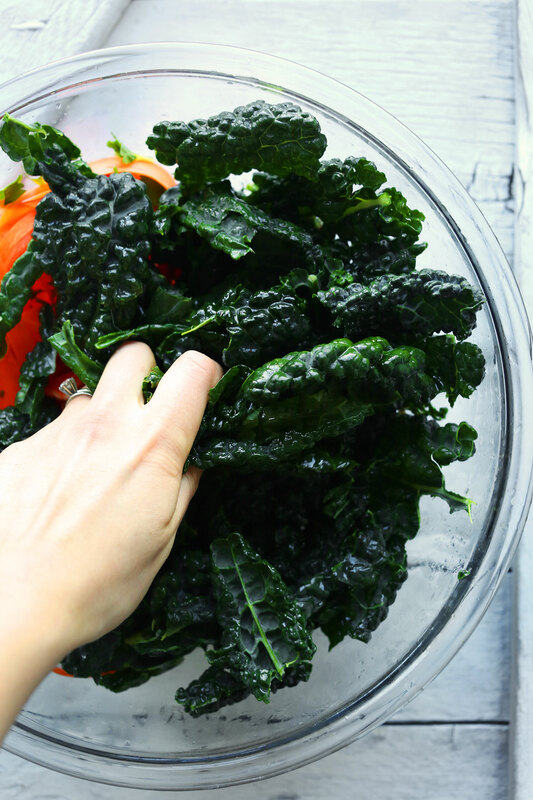 In the meantime, add kale to a large mixing bowl and drizzle with a bit of lime juice and sesame oil and use your hands to massage the kale to soften and remove some of the bitterness. Set aside. Prepare dressing in a small mixing bowl by whisking together all ingredients and thinning with a little hot water until pourable. Add green beans, sautéed shallot, and remaining salad ingredients to kale and toss with dressing. Enjoy immediately. If keeping for later, store dressing separately. Will keep in the refrigerator up to 2 days, though best when fresh. *Ribbon carrots with a vegetable peeler. *Nutrition information is a rough estimate calculated with dressing. This looks amazing!! Can you use lemons instead of limes? It’s what I have on hand. ABSOLUTELY MAGNIFICENT! I just made this for dinner and am blown away! I ate kale really just for the health benefits, but i could eat this everyday. Kale is the perfect green in this salad, any other lettuce wouldn’t stay so crunchy. I did the peanut butter version because that is what I had in the pantry. Cannot wait to try the cashew butter version, I love me some cashews. Highly recommend this to everyone! My boyfriend when back for seconds, then thirds… and he was suspect of the kale. This was SOOOOO good! Used peanut butter … the sauce was to die for! Made the salad. The drizzle on the beans also very nice. Definitely a make-again! Super delicious! Super easy! Now on permanent rotation. I used curly kale because that’s what I had. Massaged for 5 minutes with an added 1/4 tsp of salt, added the oil after that with a quick 30 second massage. Didn’t have green beans so I sub red cabbage quickly steamed 1 minute, worked like a gem. I love all your recipes that I’ve made so far. You have made it easy for my wife and I to stay vegan. I can not thank you enough. We bought the book too! Best! Made this for dinner. Love the flavor combination. The first time I made this salad, I made everything the night before then combined the dressing with the veggies and topped with cashews right before serving. It was amazing. Then I made it last night and ate it for dinner. It was mediocre last night but the leftovers were delicious at lunch today. I think the melding of the salad dressing ingredients and letting the flavor of the shallots rub off on the rest of the veggies were key. I’m looking forward to devouring a ton of this salad this summer. I used a small amount of red long pepper from Curio Spice Co. to the dressing and it added a wonderful extra dimension to the flavor. The peppery isn’t too spicy and has a nice chocolatey flavor. Thanks for yet another great recipe! This turned out so good! I made a few substitutions though; I used sunflower seed butter, forgot about the shallots, used a full bell pepper, shredded purple cabbage, carrot ribbons, fresh basil and roughly chopped snow peas. This was the perfect accompaniment to your coconut curry ramen I made tonight( another new favorite lol). Thank you again for another keeper! what oil is best instead as my daughter is allergic to sesame oil . Thank you! I LOVE this salad. I use peanut butter instead of cashew butter though. I’ve made it so many times I don’t even have to look at the recipe anymore! Thank you! I just tried this last night and it was so delicious! The lime really pulls everything together for a flavourful and filling meal. Great way to celebrate the end of summer. Another winning recipe! Hosted a small party and served all food from your recipes everything was a hit! Especially this dressing. Thanks again! Thanks for the recipe. I found your site from a reblog on http://neathabitat.com/2016/06/16/better-than-just-a-salad/#comment-753. My winter vegetables are all bolting, but I still have kale, Swiss chard and French sorrel. Cashew butter may be out of reach for now, but I am looking forward to using a peanut butter version on summer salads. This recipe was yum and I don’t usually like salads especially not ones with kale. I used PB instead of cashew butter. One thing I would appreciate is if the recipe had directions for the dressing using whole raw cashews instead of cashew butter. Cashew butter is EXTREMELY expensive (like almond butter), and I cannot afford to have it in stock. I always have raw cashews on hand though. I wouldn’t mind using my Vitamix to whip up a dressing with those. Just a suggestion! I used whole cashews for the same reason. Instead of 85 g of cashew butter, I used 85 g of whole cashews and mixed up the dressing with a hand blender. I added a little water to make it easier to blend. Even then it was too thick to pour and I had to thin it with more water. Wonderful salad, but no surprises here. EVERYTHING is good on this site. I usually can’t take too much ginger, but even the powerful punch the ginger in this has marries perfectly with the kale. Yum! Made this for my military spouses cooking club today and it was a hit! Everyone was asking for the recipe. Thanks so much! I made this last night and I must say it might be the most delicious salad ever! I followed the recipe exactly, but I also made crispy fried tofu and brown rice as sides. And it is an impressive-looking plate with all of the bright colors and texture. I make one of your recipes every weekend (when I have a little more time to cook) and I have not once been disappointed. Please keep doing what you do! I was dying to try one of your amazing recipes! This salad is delicious and the dressing is so amazing! Love it! Delicious! I subbed Tahini for the Cashew Butter since we have a Nut allergy. Thanks for the recipe! I’m “new” to Kale and every recipe like this I see amazes me on how versatile it is. YUM!! I have a bunch of swiss chard still growing from my winter garden so gonna make this recipe but just swapping the kale for swiss chard. Also, it would be awesome if you worked your recipe magic on a dish using swiss chard stalks. This salad was amazing alright! There are lots of steps to making it but well worth it! Honestly the best salad I’ve had in ages. Delicious, filling, and easy to make. You’re the best! I loved, loved, loved this salad. It was filling and so frickin’ yummy. I want to pour that dressing over everything! Wow! this looks awesome! Those are all my favorite flavors. Pinning so I remember to make this later :) Simple and delicious and healthy, I need to try those cookies! Made this tonight and it was very good! The whole family loved the dressing. I have some of it (the dressing) left over, I think it would be good in wonton tacos with crispy tofu and Asian slaw. Love all the recipes, keep em coming, thanks!!! Yay! So glad everyone enjoyed it, Tiffani! This salad looks like a dream! I’ve been loving all the Asian flavors lately, and that kale is gorgeous. Definitely need some lighter meals for spring! Thanks for this awesome recipe! I eat a LOT of salads, so I’m always looking for new and different variations to switch things up. This dressing is great–I didn’t have any cashew butter so I had to use peanut butter instead, but it was still delicious! This looks delicious! Having trouble printing it though. The doc isn’t loading completely. Not sure if it’s something on my end?? Sounds like it. Google Chrome is the best browser for printing. Why? Why did I even bother? Feeling like a healthy and light dinner tonight and started googling recipes and every website is full of ads, pop-ups, and horrible looking meals. I finally thought, “What is Minimalist Baker up to?” and logged on to your site to find this gorgeous salad, friendly and personable writer, lovely pictures….*sigh*. I will never stray again. <3 Thank you. Ginger is the BEST! So glad to have found your recipe (and your blog). You have motivated me to get up and make this spring salad. I was in Portland, Oregon for 4 years during chiropractic college and I understand the thrill for spring to arrive! I made this last night for my sister and I. She wasn’t home for dinner, so I ate without her. Oh man!! This was delicious. I bought 4 bunches of kale thinking I would need more, but nope. It was enough for dinner and my sister’s lunch. I liked it so much that I used the rest of the ingredients and made it again this morning to have for dinner this evening. I had black bean and corn pupusas to go with mine. Deliciousness!!! I love salad and this will definitely be on my go to list. I’m always looking for new ways to use kale! Love this recipe and that dressing — HOLY YUM! Following your lead on adapting recipes to what you have on hand has been a game changer in the kitchen for me. I made this instantly addictive salad last night with cucumber (seeds scraped) instead of bell pepper & tahini because I ran out of cashew butter. Geez, and Meyer lemon in place of lime – but everything else as you instructed! Still delicious and holding up well to repeat as today’s lunch. Thanks for always inspiring me! Glad you were still able to make it work! This is so delicious looking! I love all of the colors. Is there a way to maybe soak cashews and use in dressing in place of cashew butter? That might work! Let me know if you give it a go. It wasn’t quite enough quantity to blend up super smooth, so it turned out having some chunks, but the flavor was delish, and texture was fine for me! Salad got rave reviews, of course! Made this for lunch yesterday, I only had curly kale, so I cooked it a bit to make it a tad softer. It was a wonderful meal. Dressing was superb! I’ve been nibbling on the leftovers (today’s lunch) since just after breakfast! :) Thanks for this – and all of your wonderful recipes. Looks delicious! What can I use instead of Tamari? My daughter has soy allergy! That looks very very filling. I will definitely give that dressing a try. Thanks! May I ask why curly kale cannot be used? Can’t wait to try this! Cashews + Thai food is always a winning combo! Pinned it to my salad board. Thanks! I love how 95% of the time I find a recipe on FoodGawker that appeals to me, it comes from your blog. ;) Pinned! Ah! The dressing was amazing! All I had in terms of vegetables were carrots and cabbage, so I chopped those up, tossed them with some brown rice noodles and garbanzo beans, and poured the dressing on top. Holy flavor town. You nailed it! Once I finally make it to the grocery store, I’ll make the full recipe. This version will be a great lunch for a couple of days, at least! Yay! Thanks for sharing, Anne! Have you tried sunflower seed butter? I get lots of emails from vegan blogs, but yours are my favorite! You have FLAVOR down, and that is my biggest challenge. This slaw looks absolutely amazing, Dana!! Especially the cashew dressing… yum!! This salad looks delicious. I’ve been loving cashews recently, but I haven’t tried cashew butter yet. Can’t wait to try this. 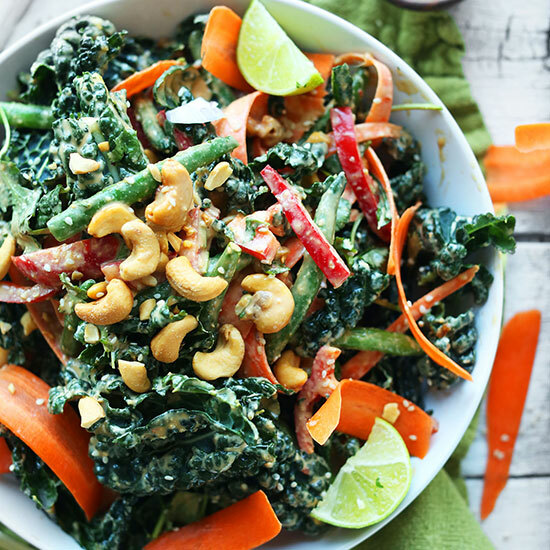 You had me at Kale, this salad is beautiful and healthy. The ingredients healthy and cleansing. Can’t wait to give it a try! Looks like such a yummy salad! Especially that dressing! I did a little over-indulging this weekend and my body is craving greens. This salad looks like it will hit the spot – pinned! Agreed! While I love the comfort food all winter, my bathing suit is begging for healthier meals. But bland food doesn’t cut if, I get bored and then binge on chocolate. Can’t wait to organize the patio and eat healthy food outside and even exercise outside isn’t so bad.